Benjamin Mathes created Free Listening Day. The first one in 2015 generated free listening in 13 countries. In the age of social media, we spend a lot of time communicating and very little time listening. April 11 is the day to change that with Free Listening Day. 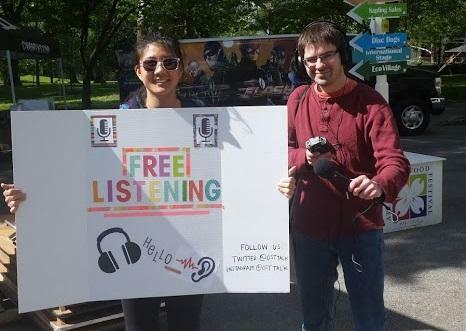 People are encouraged to stand outside holding a sign that says "free listening", and then wait and see what people will say to them. This event is the brainchild of Benjamin Mathes, founder of a group called Urban Confessional. He talks with us about how Free Listening Day grew from an idea to a global movement. On Second Thought producers Sean Powers and Linda Chen celebrated Free Listening Day by opening up their ears to people in Atlanta. On Second Thought producers Linda Chen and Sean Powers hold up their Free Listening Day sign at Piedmont Park in Atlanta. Two elderly women from Alpharetta share their attitude on living life to the fullest. An Atlanta teenager contemplates a major decision involving her church. A homeless couple in Atlanta describes how desperate they are to get off the streets.